The Portuguese Cultural Week from October 22 to 26 in Cape Town promises many exciting events highlighting Portuguese culture. The Instituto Camoes invites to various events. Read here what is happening during this Portuguese Week in Cape Town. 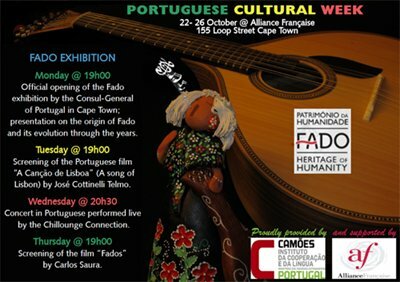 Monday, 22 October 2012: Official opening of the Fado exhibition. With presentation by the Consul General of Portugal in Cape Town on the origin of Fado and its evolution. 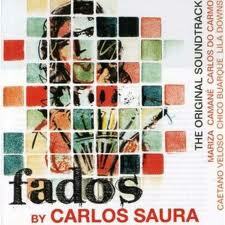 Tuesday, 23 October 2013: Screening of the Portuguese film: "A Cancao de Lisboa" (Song of Lisbon) by Jose Cottinelli Telmo. Wednesday, 24 October 2013: Live Concert of the Chillounge Connection, performed in Portuguese. Where? All events take place at the Alliance Francaise in Cape Town's CBD at 155 Loop Street. Enjoy the festivities with the Portuguese community in Cape Town! Do you want to know more about the Portuguese Cultural Week, then please contact the Alliance Francaise. Or join our Expat Cape Town forum page and find out who also will attend certain events and share your ideas about living in Cape Town. Do you like to get other great Cape Town Insider Tips? Then subscribe to my Cape Town Expat Blog and my monthly ExpatCapeTown Newsletter with lots of great tips and links on living in Cape Town.